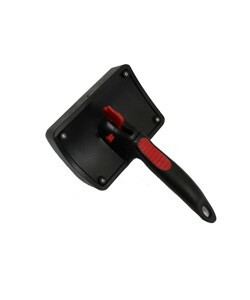 Material - Plastic handle slicker brush with curved back. Suitable for Medium dogs. Product information - Woofi Slicker Brush Medium - Universal plastic handle slicker brush with curved back .Light weight plastic handles are contoured for optimum control and designed to reduce hand fatigue. Comes in small size Excellent Grooming Results For Medium sized dogs also available. 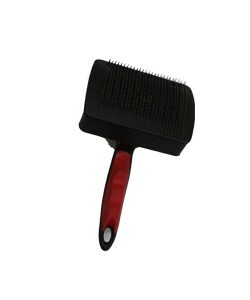 BEST SLICKER BRUSH ON THE MARKET.GENTLE BRISTLES - The Special Bristles Are Comfy For Your Dog But Firm Enough to Get Out the Toughest Tangles and Mats. ERGONOMIC DURABLE DESIGN - Effortlessly removes debris, mats and dead hair from your pets coat. IDEAL FOR ALL DOGS - Including Thin and Thick Coats or Sensitive Skin - Plus.